It's a classic story of "boom" and "bust." 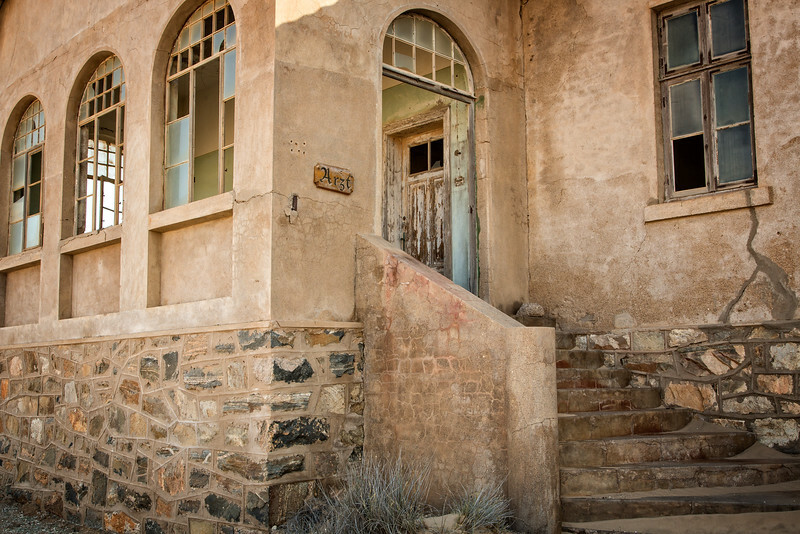 It's the story of Kolmanskop (Kolmanskuppe in German), the diamond ghost town in the Namibian desert. 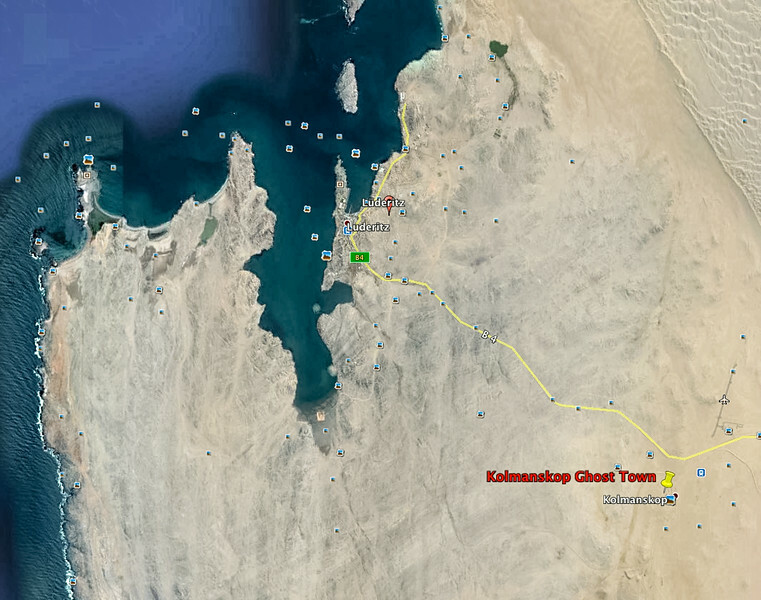 So just where is Kolmanskop? 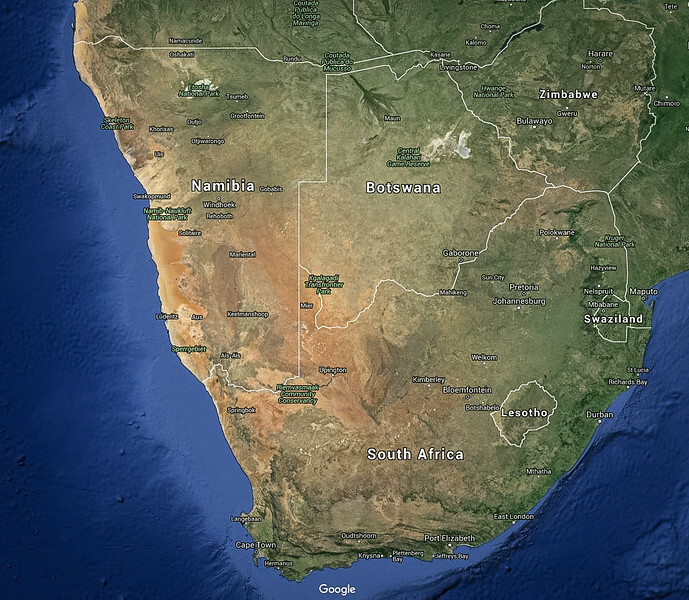 It's in southern Namibia, east of the coastal town of Luderitz about 10 kilometers. Here's the abandoned town of Kolmanskop today. Now step back in time with me to imagine what this place was in its heyday. Crawling on his hands and knees, Wilhelm Meyer sifted through the sand searching for sparkling rocks. 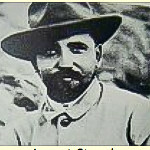 He, along with his family, were among hundreds who immigrated to the Namib desert to strike it rich in the newly discovered diamond fields at Kolmanskop. In 1908, the year prior to the Meyers family migration, Zacharius Lewala (left) was sweeping the ever-blowing sand off the new railroad tracks when he found a rock that he suspected was a diamond. He shared it with his supervisor, August Stauch (right), a German railway inspector, who confirmed it was a diamond. 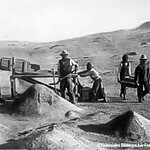 Soon, other German miners joined Meyer and began creating the settlement called Kolmanskop. Germany had colonized what is now Namibia in 1884, calling it German South West Africa. 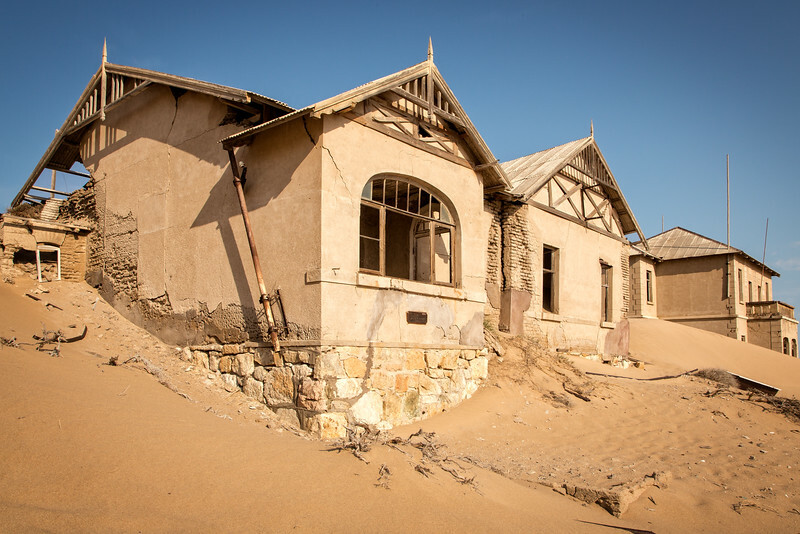 The German government quickly saw the potential wealth of the Kolmanskop diamonds and declared a 26,000 kilometer square area around Kolmanskop as a “Sperrgebiet” or forbidden zone, which still exists today. 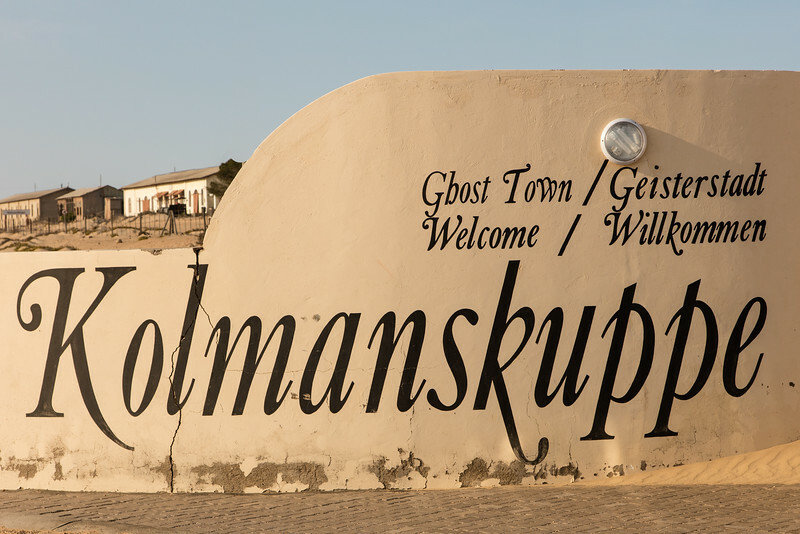 When we visited Kolsmanskop in October 2015 it was tempting to wander away from the town to do some sifting through sand in hopes of finding another Hope diamond, but I passed up this opportunity, acquiescing to my sensible side since mining on your own is forbidden and can get you arrested. 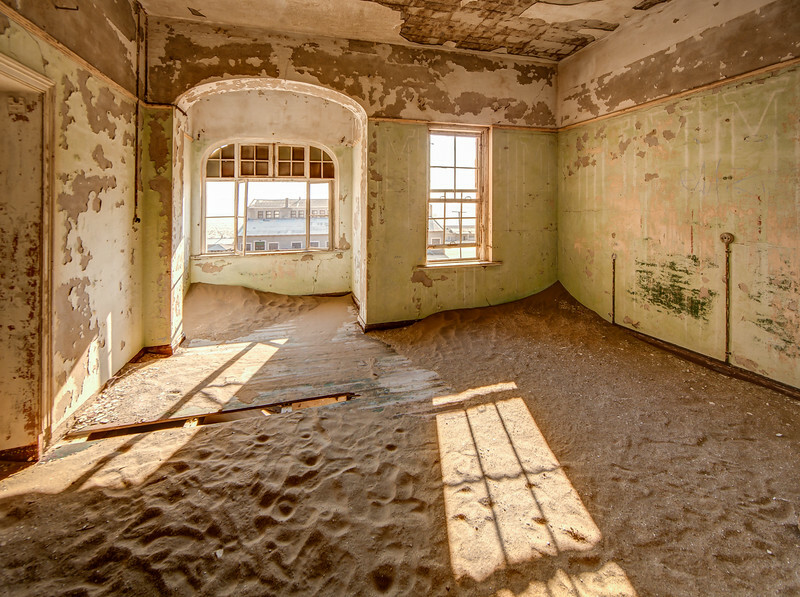 Kolmanskop was born in 1908, blossomed for the next 20 years, and was abandoned in 1956. Through World War I Kolmanskop yielded 5 million carats of diamonds (a carat is 200 milligrams). 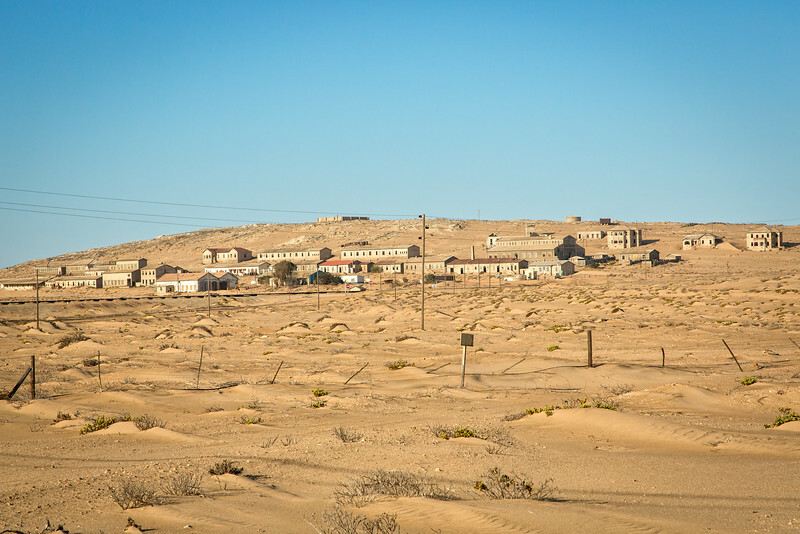 After World War I the town began to decline because the demand for diamonds abated, fewer diamonds were being found in the immediate area, and more productive mining was discovered south along the Orange River, the border between Namibia and South Africa. Wilhelm Meyer became a mining supervisor and with his family lived a privileged life in Kolmanskop. Pictured here is one of the mansions where supervisors lived. After dropping the children off at school, Frau Meyer would shop most every morning at the butchery and bakery. Here's one of the early class pictures. After school the children could play in the gymnasium, playground, or swimming pool. 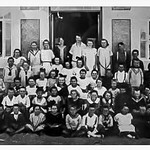 As shown in this historic photo, the Germans who settled Kolmanskop brought with them the Turnverein, a gymnastics program developed in the mid 1800s. 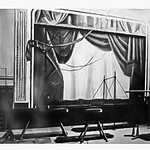 Fueled by the wealth of the diamonds being harvested, this remote town offered its residents a theater and ballroom, with orchestras traveling from Germany to perform classic concerts. Imagine it's Saturday night at the Entertainment Hall. The oompah band is playing Ein Prosit (I salute you), people are dancing, laughing, and of course drinking cold German beer. Right: Entertainment Hall at Kolmanskop. As part of the Entertainment Hall, the town had a two-lane Skittles facility. 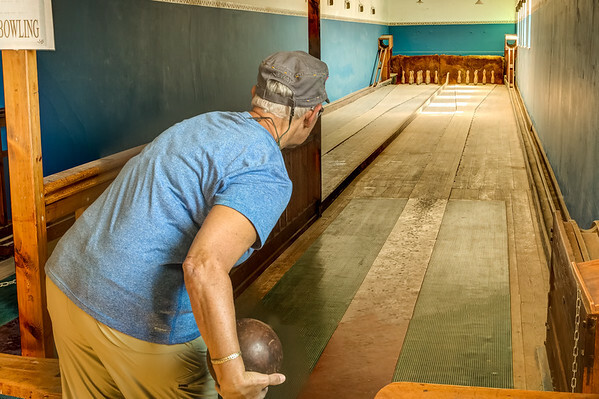 Originally a form of lawn bowling, the community leaders quickly deduced that bowling in the sand wouldn't work too well so they brought the sport inside. Left: Julie preparing to throw a strike! Walking in sand is hard work. So the town developed its own tram system as shown in this photo to the right. 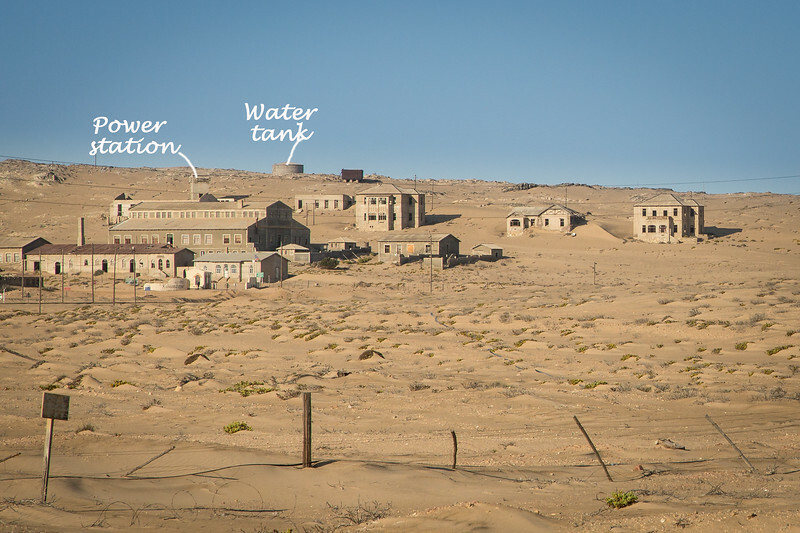 Water, water, how did Kolmanskop get its water? It was imported from two sources. 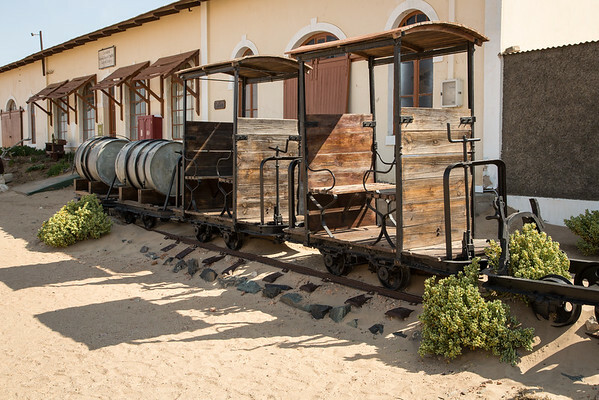 It was shipped from Cape Town to Luderitz, a distance of 1100 kilometers, and then carried by mule to Kolmanskop. The other source was water piped from Elizabeth Bay, about 30 kilometers south, where the Germans had built a small desalinization plant. Amazingly for the time, Kolmanskop had its own ice-making plant and every morning an ice block and fresh water were delivered to each house. You can see the water tanks on the back of this rail car. 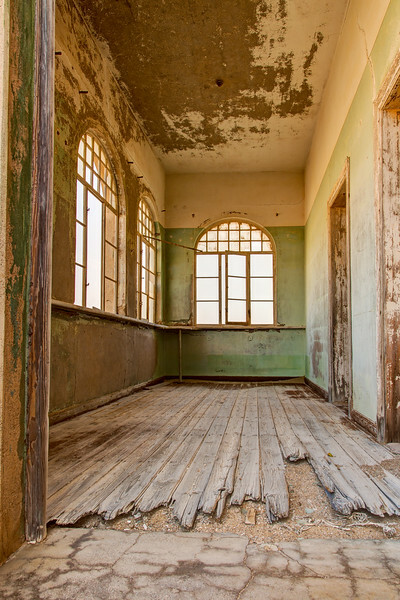 The residents of Kolmanskop had decent health care with a building housing the medical staff. The town had the first x-ray machine in Southern Africa. X-rays were taken not only for diagnostic purposes, but to check suspected workers of stealing diamonds by swallowing them. 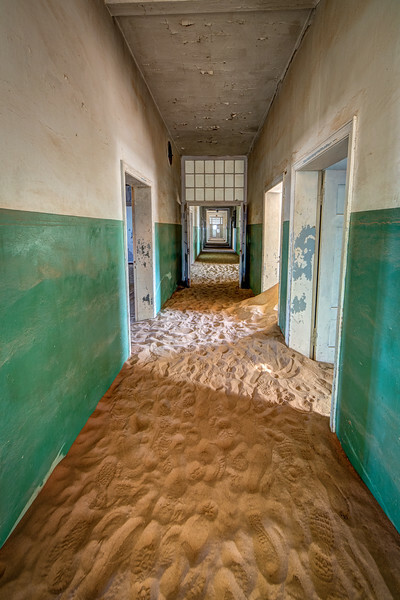 This is the long corridor of the hospital, now overtaken by the sand. 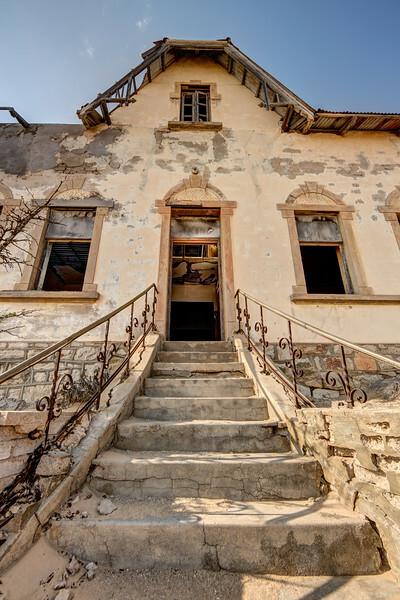 Can you see nurses scurrying through the halls as they attend to the sick and injured among the 400 German colonialists and 800 Ovambo contract workers who lived here? 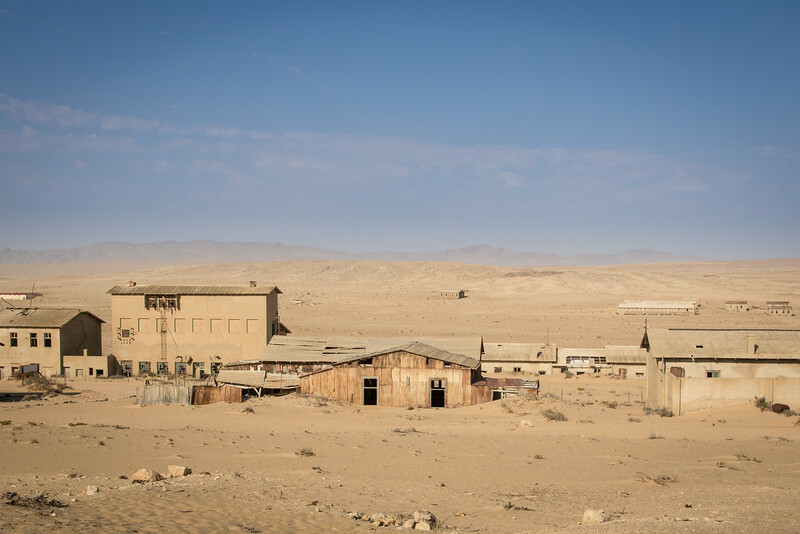 The town had electrical power throughout, which is all the more remarkable as there are many parts of Namibia today that remain without electrical power. The town was built in the Bavarian style surrounded not by the Alps but giant sand dunes. Regardless, life was amazingly good for the residents of Kolmanskop considering its remote and spartan location. Now let me show you more of this abandoned town that the desert is reclaiming.